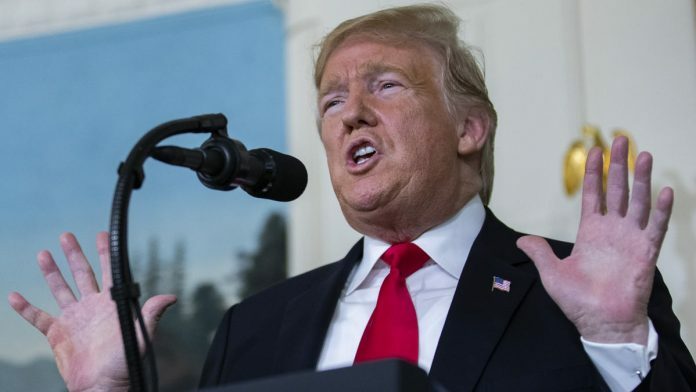 Speaking to the Ministers of the Global Coalition to Defeat ISIS, Trump said that US and its partners have retaken more than 20,000 square miles of land captured by the ISIS in Syria and Iraq. Washington: ISIS has been decimated, US President Donald Trump has said, adding that sometime probably next week, he will formally announce to have 100 per cent of the caliphate. He said the new approach developed by his administration, empowered US commanders in the field, enabled partners on the ground, and directly confronted ISIS’s “wicked” ideology. Over the past two years, US and its partners have retaken more than 20,000 square miles of land, he said. US and its international partners, he said, have freed more than five million civilians from the grip of these bloodthirsty killers. “Thanks to the Global Coalition, including all of you here today, and to our other partners, the ISIS caliphate has been decimated. Nobody thought it was possible to do it this quickly,” Trump said. Later in a statement, the Ministers of the Global Coalition to Defeat ISIS/DAESH said that the territorial defeat of ISIS in Iraq and Syria will mark a significant milestone in the war against ISIS. But this does not mean the campaign against ISIS is over, it said. In 2019, with the conventional military effort against ISIS in Syria nearing culmination and shifting to a supporting rather than a central role, the Coalition members will open a discussion to plan the next phase of the campaign, it said. This could involve an effort to counter ISIS’s reversion to insurgency in Syria and Iraq, the statement said. The meeting was attended by foreign ministers and representatives from more than 70 countries.